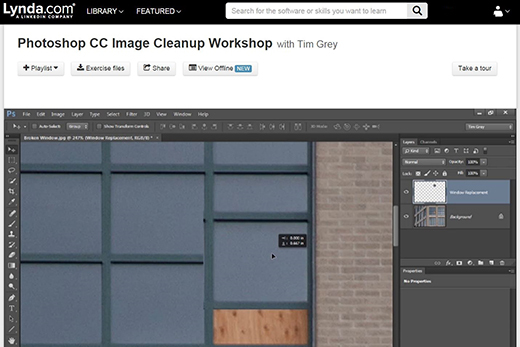 This screenshot of a Photoshop tutorial depicts one of thousands of videos offered on Lynda.com. Current students, faculty and staff have free access to Lynda.com through Emory University’s license. Emory Libraries and Information Technology Services (LITS) has expanded the University’s license with Lynda.com so current Emory University and Oxford College students, faculty and staff can access the video tutorials from any computer or mobile device using their Emory.edu logins. Lynda.com is an online training library that contains thousands of video courses on technology, business and professional skills. Each course is broken into short videos that cover specific skill topics. Current students, faculty and staff have free access to Lynda.com through Emory University’s license. A new portal webpage is available at it.emory.edu/lynda to make login and access easy. The site includes a list of new and recommended courses for faculty and students, FAQs, and a section on how to access Lynda.com and contact the support team. Previously, Lynda.com was available to students and faculty on limited workstations in Emory’s libraries or through individually purchased licenses. “It’s such a rich collection of content. I think people will find it valuable, and I hope they’ll take advantage of it,” says Lee Clontz, LITS manager of Teaching & Learning Technologies. Students and faculty have a range of areas from which to choose instructional content, including business, design, 3-D and animation, audio and music, education and e-learning, IT, marketing, photography, video and web work. There are also classes on various types of software and digital tools, such as Photoshop, Excel, Office 365, AutoCAD, InDesign, Blender, Linux, Tableau, Java, Python, After Effects, Premiere, Final Cut Pro, Bootstrap, WordPress, Flash Professional, and more. Steve Bransford, a LITS educational analyst who serves as video producer for Emory’s Coursera courses, has taken 15 to 20 Lynda.com courses – including getting up to speed when there was a massive overhaul to Final Cut Pro, then again when Emory’s Coursera team shifted from that editing program to Adobe Premiere Pro – in addition to cherry-picking individual videos based on different skills he wanted to learn. Bransford says a key aspect of some of the Lynda.com training videos, particularly the software material, is the exercise files, which allow the viewer to work on the skills as they’re being presented in the video. Lynda.com has expanded into business and career development courses in recent years. A wide variety of topics are covered, such as leadership, making better presentations, communication tips for managers, advanced fundamentals, managing international projects and media training, to name a few. Founded in 1995, Lynda.com started as technology training product. The company was purchased by LinkedIn.com in April 2015. “I think one of the reasons LinkedIn found them so interesting is that they’ve really expanded into a broad array of business prep training in many different areas,” Clontz says. It’s great for job-hunting students also, with videos on resumes and cover letters, Skype how-tos, job search strategies, and other areas. There is even a course called Translating Your Military Skills to the Civilian Workplace. Faculty will also be able to integrate Lynda.com content into Blackboard and use videos in their courses, such as when their students need to learn Photoshop or some other software program for a class. Faculty can get help integrating videos by contacting a LITS Teaching & Learning Technologies specialist at lyndasupport@listserv.cc.emory.edu. Faculty and staff who already have an individual Lynda.com account will have the opportunity to migrate personal playlists or course histories into their Emory account when they log in for the first time. Grace Bizzell, a senior multimedia developer in the Goizueta Business School, has taken part or all of 56 courses, most of them in multimedia and design, since she opened her account with Lynda.com in January 2010. She uses Lynda.com to keep up with the latest updates and releases from the Adobe Creative Suite and to learn specific tasks in Microsoft Office. She’s earned 19 certificates, which she says are great for including with your annual review. “I love Lynda so much. It’s great,” Bizzell says. “It has all of my bookmarks and my certificates for the courses I completed. If there is something I don’t remember exactly how to do because I don’t do it every day, I can dip back in to Lynda and refresh my memory. “They have so many courses that cover so many things, you’re bound to find something that’s relevant to what you do,” Bizzell says.